As a kid born in the 70’s and brought up in the 80’s, this was an era full of cult classic children’s TV programmes. The Boy from Space, The Flumps and the pink fluffy cat called Bagpuss all spring to mind. The latter is due to receive a vinyl, CD and download release entitled The Music from Bagpuss of previously unheard master tapes which covers folk, mice acapella and spoken word. With BBC 6 Music’s Gideon Coe recently championing the release Matt Mead reviews the release and The Art of Smallfilms book released via Four Corners publications that goes hand in hand with the music release, for Louder Than War. The discovery of The Music From Bagpuss by Sandra Kerr and John Faulkner filled me with excitement to hear the soundtrack to this much loved TV programme. I remember watching TV at my Mother’s home as a youngster, we had a TV that was rented, which meant we had to put 50p pieces in the back of the TV for the contraption to work. If the 50p ran out of time, the TV would turn off automatically and meant minutes scrambling round for a spare 50p to be able to further engage in whatever was on the box. Bagpuss was a delight to watch and was probably a programme that ran out of 50p’s. The folk guitar opening made the day’s as a kid drift by like a fairy-tale. The hope to one day be able to speak to a talking cat, along with talking mice as well as talking cuddly toys long outdated Toy Story, and Bagpuss had more authenticity to it, real life animation kept the freeze-frame feeling real, rather than computer animation which is now all the rage in children’s TV. The 32 tracks that make up the main body of this album are a mix of full on songs, improvised rhymes and some silly love songs. What gives additional significance here is the clarity of the audio, you feel like you are there, next to Sandra and John as they are performing these wonderful songs, which brought to life Gabriel the Toad and Madeleine the Rag Doll. There are the well-known songs such as The Bony King of Nowhere, The Princess Suite and Porcupine Song, all sung with a happiness and joy that is rarely seen these days on children’s TV. For myself children’s TV used to take you away to magical, mysterious, daydream places as a kid and it was certainly the music that added that extra sprinkle of magic to proceedings to alot of the programmes i used to watch, Bagpuss being one of the main culprits, which makes listening to this collection all the more joyful to listen to, as i remember those feelings. There are also those high-pitched mice songs too, We Will Fix It, We Will Wash It, We Will Fold it etc.. which will resonate with anyone that has seen this programme at some point, seeing the jittering mice dance and joyfully enjoy their own singing. There are also never before heard outtakes of the duo and the mice, which adds humour and an extra sprinkling of magic to proceedings. Overall this is a wonderful trip back in time for those that were around at the time of the TV programme being first aired. It is also a chance for new fans of saggy old cloth cat to embrace this enduring, lovable brand. There is one thing I would have changed though. The new artwork is wonderful, the album comes in a limited edition shop window sleeve LP, complete with 5 interchangeable lithograph prints, as well as 24 page Bookback CD with all illustrations done by Hannah Alice, but if I am being totally honest I would have preferred to have seen the original artwork and this is where The Art of Smallfilms book comes into play. 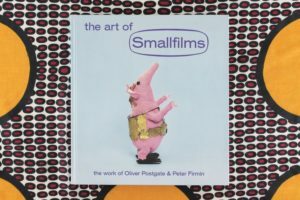 Having previously released albums of children’s TV programmes such as Ivor the Engine and Bod serial collector of Library Music and other related archive findings Jonny Trunk with the help of Richard Embray have edited The Art of Smallfilms: The Work of Oliver Postgate and Peter Firmin. This book is quite something, even an emotional experience to actually get your hands on the book. It’s almost too good to actually exist. It’s like you’re daydreaming that something as beautiful as this doesn’t exist, but it actually does! The meticulous attention to detail is quite something, you get to see every single minut piece of detail of Bagpuss and it’s supporting cast. 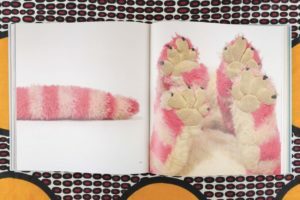 From showing every angle of Bagpuss, including close ups of paws and tail, there are close ups of the mice, the wooden Professor Yaffle, rag doll Madeleine and Gabriel the Frog with multiple pages given to each character. The dolls are all in pristine condition which give you the desire to want to try and step into the pages literally to be with the characters to be able to play with them as a kid all over again. Magnificent. 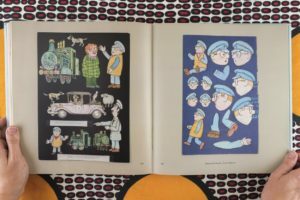 What is also on show within the book is the original artwork and paper cut-outs from Ivor the Engine, Noggin the Nog, along with insights into how they were made. The artwork pages of Ivor the Engine and Noggin the Nog are spell binding. You can spend hours, months and years enjoying these pages. As previously mentioned the attention to detail is quite something, astonishing even, masterful, you get my gist. Plus you get to see the inner workings of The Clangers. You might think of the pink pig like space creatures being more cuddly than they were actually made. Made with wood and meccano with nuts and bolts under the cuddly exterior is a masterful stroke by the creators, considering at the time of the orginal programme Oliver and Peter made these creations from their own imagination. A fascinating and extrodinary book for anyone who wants to embrace their childhood again. These releases are an absolute treat for kids and kids at heart. Both releases are reasonably priced and should see an influx of Christmas wish lists being updated with these gems at the fast approaching time of year. 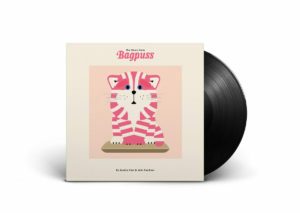 The Music from Bagpuss album can be purchased from the Bagpuss bandcamp site. The Smallfilms book is already available to buy from Jonny Trunks website or from the Four Corners publishing website.